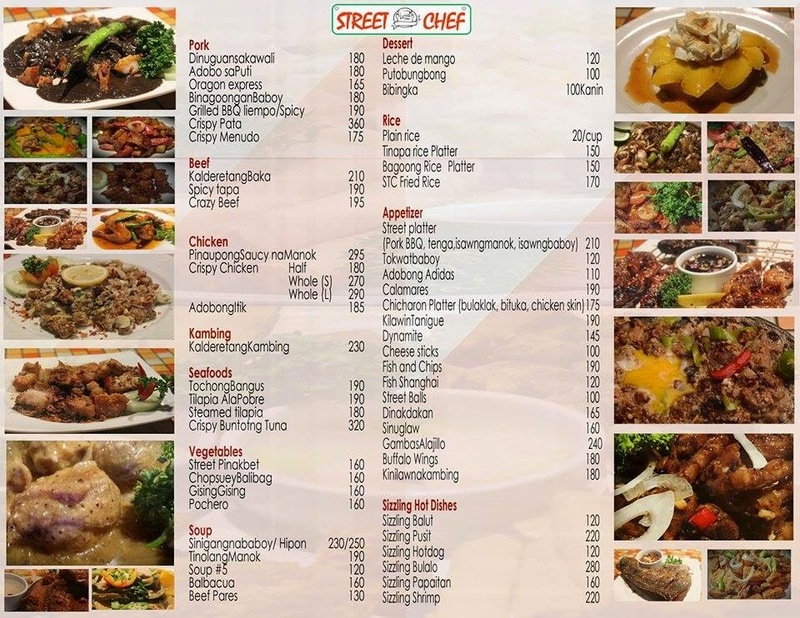 What Sizzles at Street Chef in Mandaluyong? Upon stepping into Street Chef Restobar in Mandaluyong City, I already knew I was entering a cool park-and-dine establishment. Located a few blocks away from the city hall, Street Chef offers a wide range of Asian food--"Asian Fusion", as it claims. Do not judge right away with the restaurant's name because it does not serve fish ball or kikiam. The restobar has a special dish that will make people gaga over balut- Sizzling Balut, a re-invention of the Filipino exotic dish. Street Chef has created a cheesy sauce that puts a new taste to the street food. How is my Street Chef experience? It is essentially satisfying; I came all the way from Makati but I left the restobar with no regrets. Tochong Bangus has won my heart for its unbeatable crisp. You're gonna love the sour tomato paste for sure. Since I am committed to come back with my loved ones, this dish is on my priority list to order. Adobong Adidas made me remember the time when my mom served us chicken feet for lunch. That was the first time we learned chicken feet can make a good meal. I suggest you order this for pulutan. Pinakbet is also worth the try. If you are a moderate vegan, this dish satisfies your soul. Since my doctor has already warned me about eating less veggies, I was happy to see Pinakbet served on the table. Beef with Mushroom proves that Street Chef is not an ordinary restaurant. The moment you take your first spoon, you taste the rich cream. And you will feel as if you are eating in a five-star restaurant-- I'm not kidding. Sizzling Balut is the winning element on the menu as what I have discussed earlier. I know not all would try this dish. What I like about this is that the sauce helps you forget that you are eating balut. I think Street Chef is the only restaurant that has this type of dish. Nilagpak is a bit spicy, the perfect mate of beer! You can have this as your pulutan. Baked Macaroni should never be out of sight in a group meal. Leche de Mango is rich in taste. You will feel the mango fruit in your mouth even with just one spoon of it. Gabriela is a light drink invented by Street Chef's own bartenders. If you want a stronger one, the bartender can make one for you, but that would no longer be Gabriela. The restobar also gives you other liquor offerings. When it comes to the ambiance, it is fairly minimalistic if not dry. One word to describe it: MASCULINE. The ceiling is high enough and it leaves a different feeling of freedom with its open space. Even if it is situated along the road, the air is not that polluted with the low number of cars passing along. The restobar can accommodate corporate parties; it is an alternative to closed restaurants. As mentioned earlier, I see Street Chef as a park-and-dine restobar that is perfect for motorists and men workers. I hope to see car wash services and sporting amenities in the future. Another thing that makes the restaurant special is that it employs non-culinary cooks and non-HRM graduate baristas. However, these employees are all TESDA graduates so the quality of food is still maintained. And since I have already dined there already, I say these guys are doing a great job!